Even though regular texting is no longer in fashion, every once in a while everyone tends to land up in a situation when sending out an SMS becomes a good idea. Sometimes the connectivity is too low to use internet-based messaging apps; sometimes it’s better to send a text message that will catch the receiver’s attention as soon as he switches on his phone. Android has a lot of trendy, multi-functional messaging apps. Some have gorgeous interfaces, some have rock solid encryption. 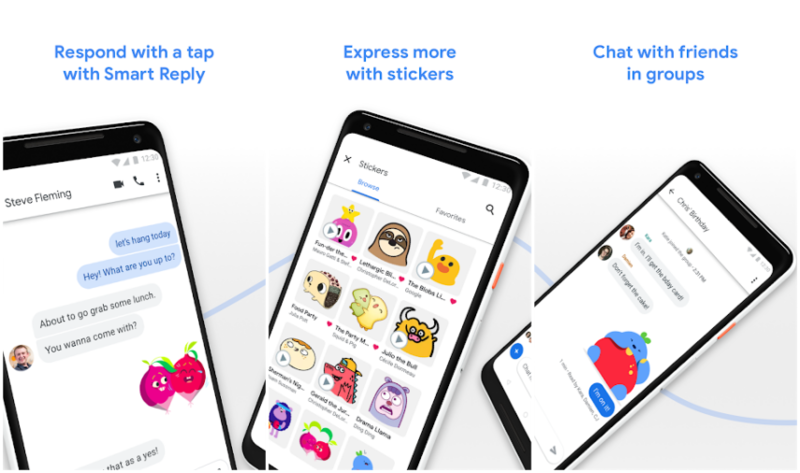 And they all come with smooth functionality that makes messaging as enjoyable an experience as its superior counterpart, instant messaging (or web chatting). 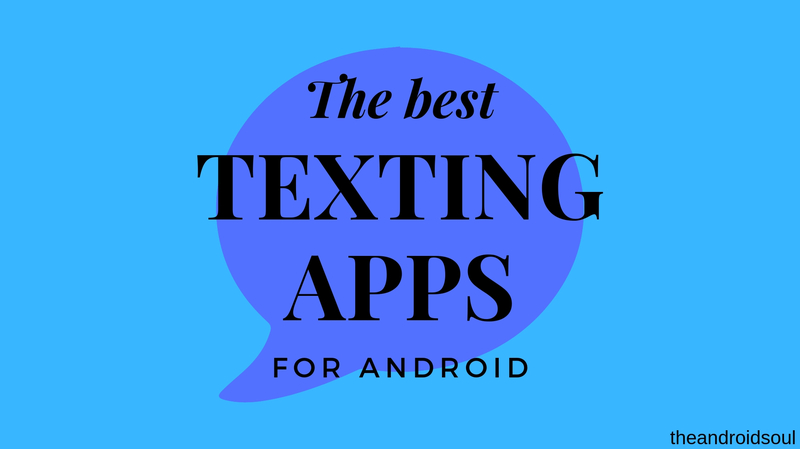 For our readers, we have studied and curated a list of the best messaging apps offered within Android. We took into consideration a multitude of factors, such as popularity, functionality, interface etc. The best messaging apps at the moment are as follows. The Mood Messenger app gives tough competition to its rivals, with amazing features and numerous customize options. With zero presence of pesky ads, this app is for users desirous of a smooth, frictionless experience. This app has a typing indicator (to see when the user’s contact is writing), chat encryption, private conversation to hide messages and protect them with a password, spam blocking to blacklist annoying messages and an animated GIF library. Pulse SMS is an aesthetically pleasing, next generation SMS and MMS app that is incredibly fast and secure. Pulse effortlessly syncs messages across all device belonging to the user that has the app installed. With Pulse, it is possible to send and receive, anytime and anywhere, SMS and MMS messages from the real phone number. Additional features include: multiple global and per-conversation theme options, password protection for confidential conversations, the option to blacklist pesky spammers, delayed sending feature to give the user time to edit or cancel messages, automated replies based on contacts, keywords, and driving/vacation mode. 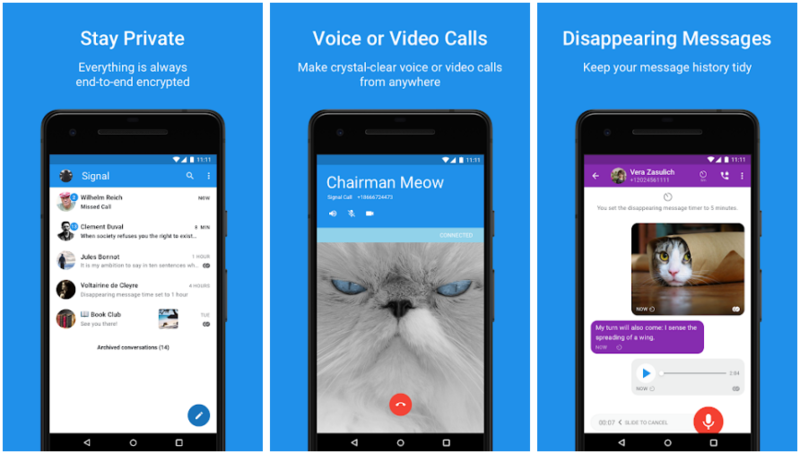 Signal Private Messenger is the most secure SMS apps in the Android market, as it uses an advanced end-to-end encryption protocol that provides privacy for every message every time. Using Signal, a user can communicate instantly while avoiding SMS fees, create groups to chat with multiple people at once, and share media or attachments with complete privacy. To reinforce the security protocol employed by Signal, the server is never granted access to any of the user’s communication and never stores any of the user’s data. Textra is a beautifully interfaced text messaging app with a host of customizable features. 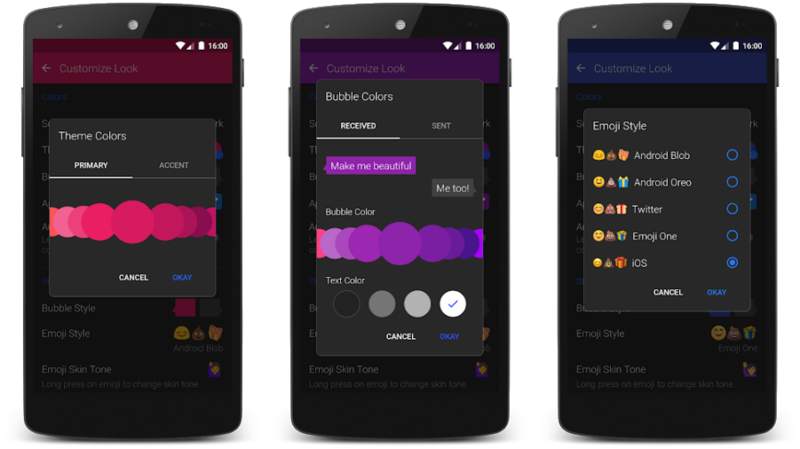 A user can switch theme and bubble colors, signatures and notifications (LED color, sound, vibration, privacy, reminders, and muting), that too per contact. Over 2700 Android, Twitter, Emoji One & iOS style emojis are present. Textra is fully compatible with Pushbullet, MightyText, Android Wear and Android Auto (car) for enhanced notifications and quick reply. Textra supports dual sim devices for Android 5.1 and above for both SMS and MMS. Google Messages brings with it the quality reminiscent of all Google apps. The clean and clear interface brings with it a host of seamlessly working features, such as instant notifications, smart replies, easy sharing, richer conversations. Integration of Google Pay allows for sending and receiving payments. That you can view the messages on PC through this app, using the ‘Messages for web’ is in itself one great reason to use the app in place of any other app here. To enable, open the app, tap the 3-dot menu button at the top right, and tap on ‘Messages for web’ option. Follow the instructions to set it up and start seeing your text messages on PC at https://messages.android.com webpage. SMS Organiser is the perfect messaging app for people whose mantra is living an organized and orderly life. A product of Microsoft, SMS Organiser automatically organizes the user’s SMS inbox into Personal, Transactional and Promotional category to help declutter the SMS Inbox. There are other useful features too, such as the option to quickly read unread messages (with no presence of the read ones), smart reminders, smart assist, smart backup, and smart personalization. 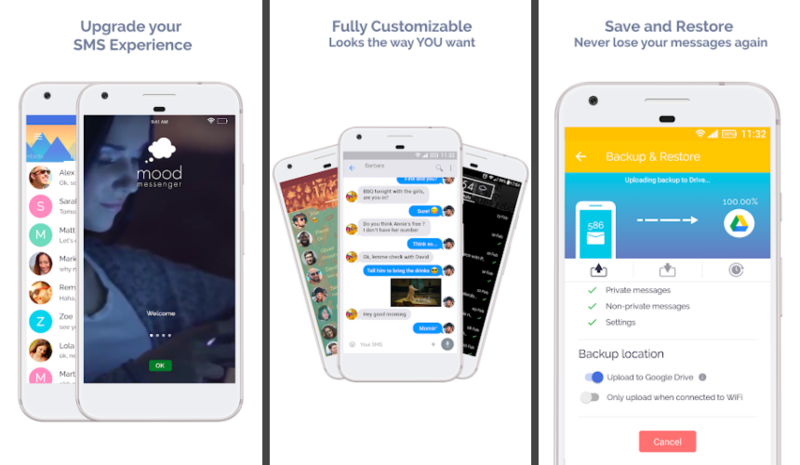 SMS Backup & Restore is an app that mainly backs up the phone’s text messages and call logs and recovers them when the need arises. It also encompasses other handy features, such as: an SMS organiser that generates automatic reminders of upcoming trains, flights, buses, movies and bill payments in time (Customized reminders can be set up just as well), option to select which conversations to backup and/or restore and fast transfer between 2 phones (over WiFi direct). 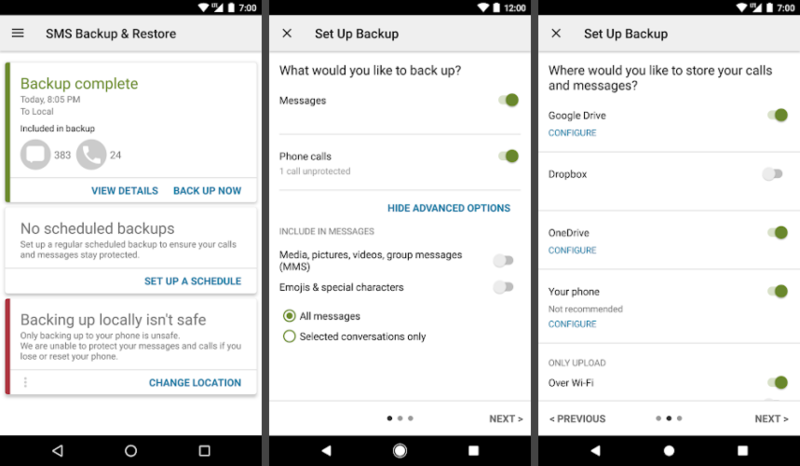 There is also an option to take regular automatice backups, even online to Google Drive, which makes this app a life saver, virtually guaranteeing tha you will never lose your SMSes. Even when changing devices, the app comes handy in trasferring the messages and call logs from old device to a new one. 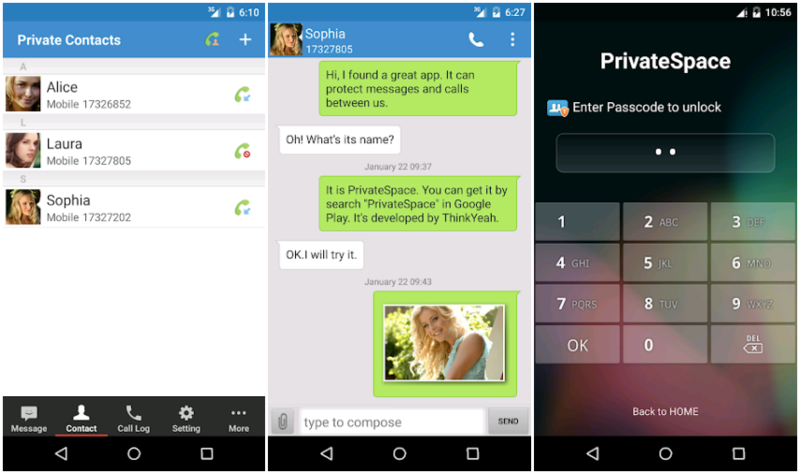 Private Space is the best privacy protection app in the Android market. The user can use it to hide his contacts, messages and call logs, even the app icon itself so that no one can become aware of its existence in the user’s phone. Within the app, Private Space sets up a special corner where the user can add any contacts. Once that is done, incoming messages, outgoing messages and call logs of these contacts are stored within that corner and are never shown in the normal message box or call log history. There are so many incredible apps made by incredible creators. 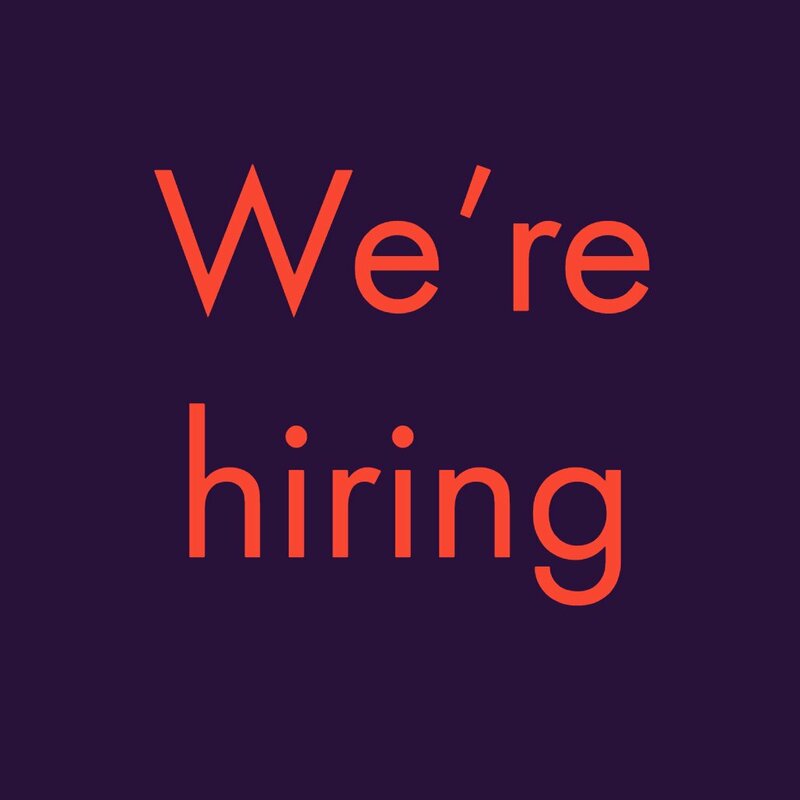 As it’s quite tedious a job to track them down by oneself, you can rely on us to do the work and keep you up-to-date with the best Android has to offer! Have you started using one of these apps yet? Which one is your favorite? Tell us in the comment section below.